So, you believe your commute to work is a challenging ordeal? Well then, try traveling from northern Canada to the Texas coast and back every year … under your own steam. Now that’s a long, risky 2,500 miles one way — 5,000 round trip commute. Whooping cranes migrating north for nesting. Astonishingly whooping cranes are not the only birds that make long migrations. On the North America continent more than 300 bird species migrate including cranes, waterfowl and song birds. At least 40 percent of all bird species are migratory. Billions of birds migrate every year between warm winter habitats and breeding grounds, often in the far north. Unfortunately, increasing land development by humans is causing unprecedented threats to migratory and non-migratory birds and other wildlife. This is especially true for the Aransas-Wood Buffalo population (AWBP) the only remaining wild self-sustaining flock of whooping cranes on the planet. 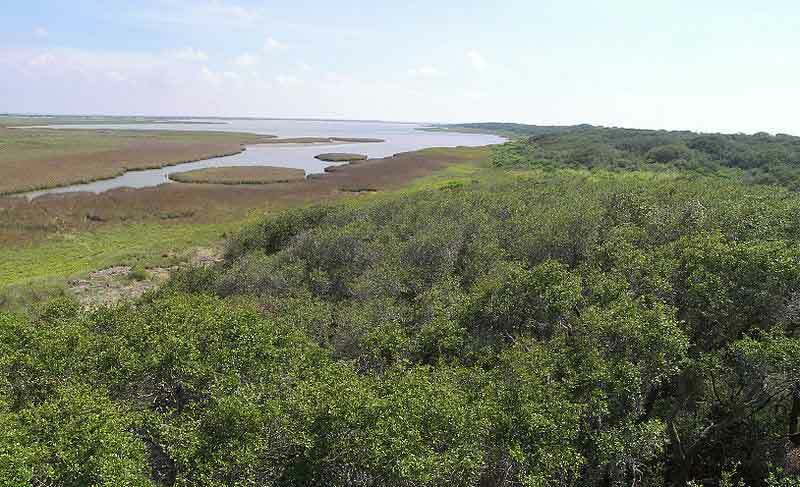 One of the greatest needs is for more secure habitats within the migration corridor and adjacent to the Aransas Refuge. Although portions of breeding and wintering habitat frequented by the wild population are protected, those places are also geographically isolated. Habitat within the AWBP migration corridor is largely unprotected. The migration between Aransas, Texas and the Northwest Territories of Canada spans a continent. 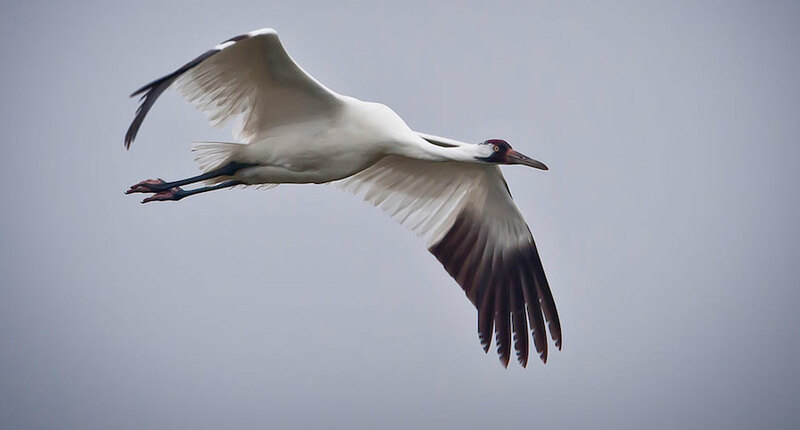 Many dangers exist in the approximately 5,000 miles the whooping cranes must travel every year. The birds must stop daily for feeding and rest. 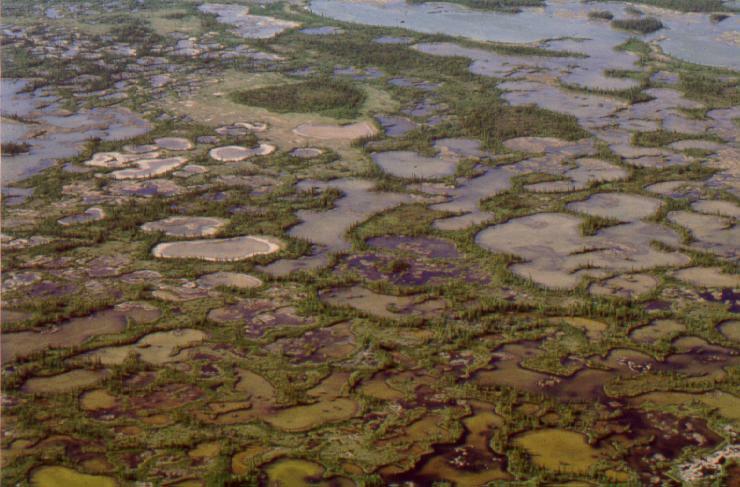 Stop over areas need an adequate supply of freshwater and food to improve the odds of the whooper’s survival. It would be most beneficial for daily stopovers to be located approximately every 50-100 miles along the migratory corridor. Due to varying weather patterns whoopers may need to stop unexpectedly. Additionally, birds having to fly too far in a day may reduce their overall health and fitness. Until recently, little was known about where and when some whoopers stop over. Developing a comprehensive analysis of their migratory flight patterns that identifies the most critical areas and suitable habitat ensures the cranes continue to be viable. To learn more about the AWBP, the Whooping Crane Tracking Partnership began banding and tracking birds from the population in 2009. The purpose of the project is to document whooper locations, monitor their survival and identify their stop over locations. 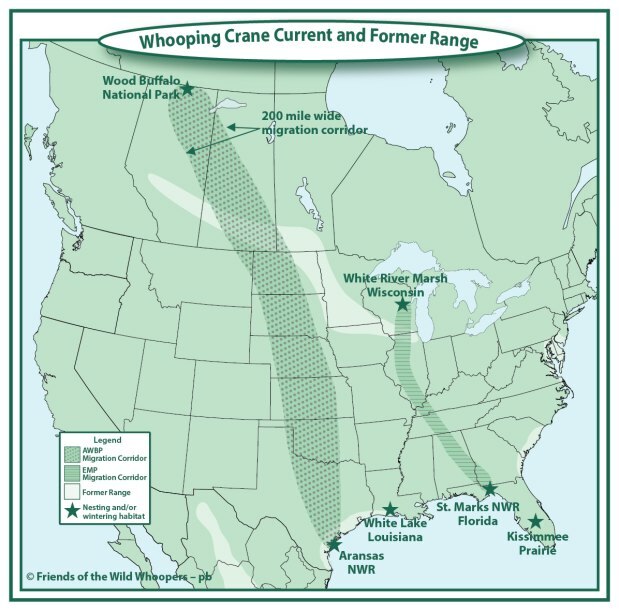 It is essential that all interests work together to help protect and manage whooping crane habitats as well as avoid destroying or degrading already well documented crane stopover sites. Attention needed: Friends of the Wild Whoopers (FOTWW) believes that much more attention is needed to properly protect and manage the only remaining wild self-sustaining flock of whooping cranes on the planet. This flock has served as the “Noah’s Ark” for several efforts attempting to establish additional migratory and non-migratory flocks. The only remaining repository of genetic material from the original flocks of whooping cranes is embedded within the AWBP population. Therefore FOTWW believes it is essential to provide the utmost care for this population. Experimental projects: Several attempts have been, and are being made to establish new experimental flocks of whooping cranes. 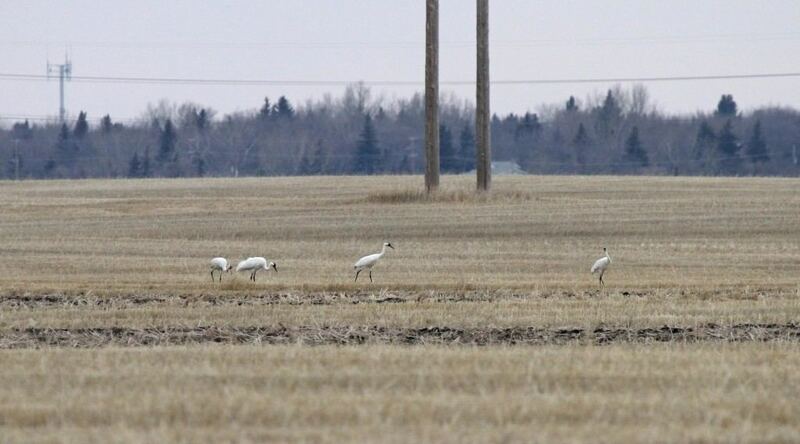 These projects are attempting to establish additional self-sustaining whooping crane populations in accordance with the International Recovery Plan for the Whooping Crane. 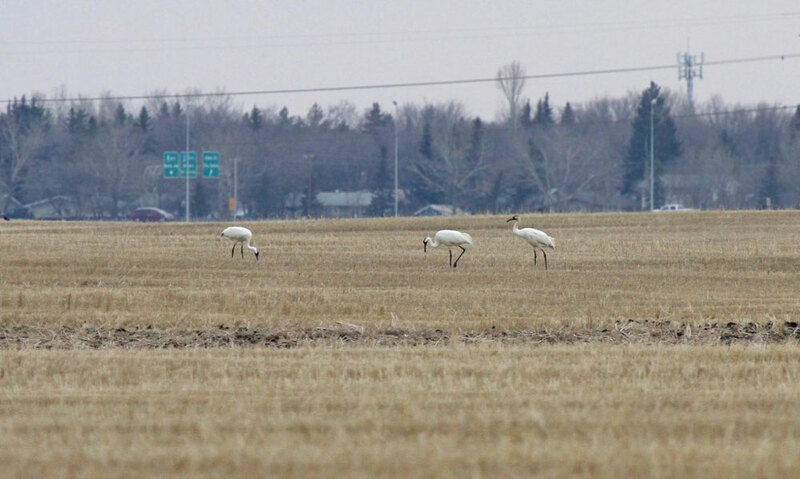 The projects are under the guidance of the Whooping Crane Eastern Partnership. Young whoopers are initially hatched and reared in captivity and then introduced into wild habitats using several methods. 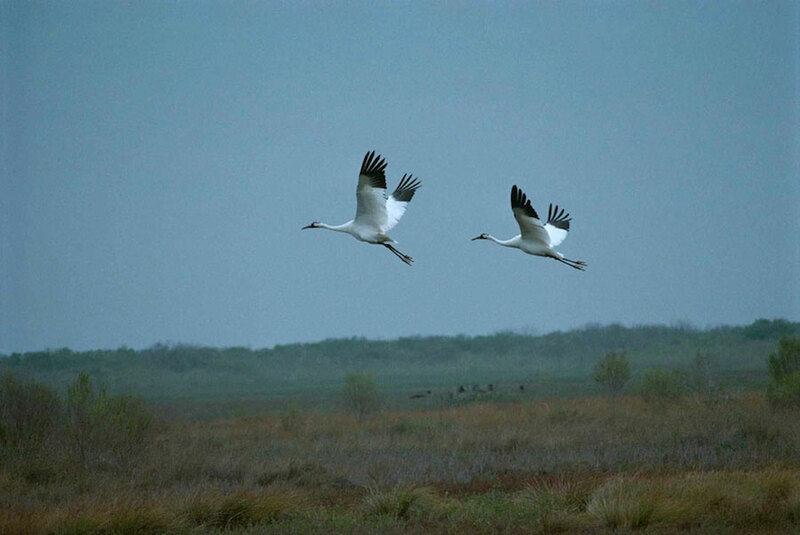 One project trains young whooping cranes to migrate between wildlife refuges in Wisconsin and Florida in an Eastern Migratory Population (EMP). Some of these whoopers have begun nesting and have raised several young. 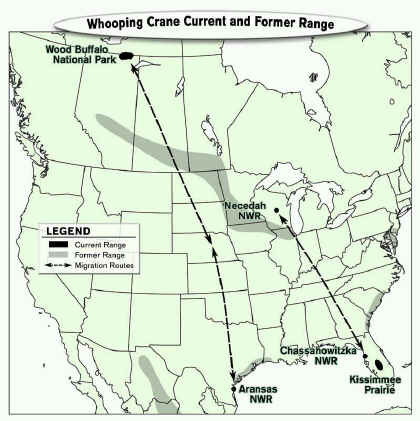 The migration corridor for these EMP birds is depicted in figure 1. Another project is attempting to start a non-migratory flock in Louisiana. These whoopers are also reared in captivity and introduced directly into the White Lake wild habitats. Conservationists are hopeful that these two projects will be successful. Until these two flocks establish themselves by reproducing and adapting to the natural environment, they are considered as experimental. 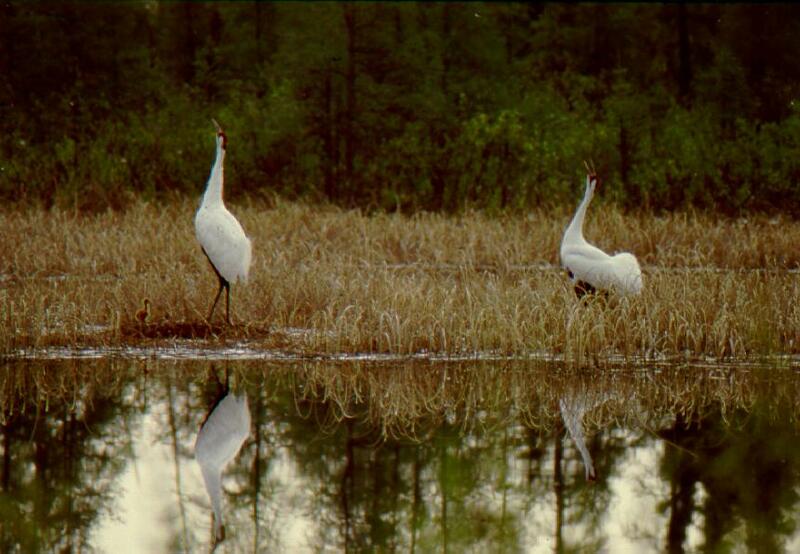 Beginning in 1993, a flock of Whooping Cranes was reintroduced in the Kissimmee Prairie in central Florida. An average of 20 chicks, hatched and reared in captivity, was released at the Florida site each year in an effort to establish a new flock of non-migratory whoopers. Some of these birds matured and began nesting. In 2002, the first whooping crane in this flock fledged. This Florida non-migratory flock is no longer receiving release captive reared whooper chick. It experienced high mortality and low reproduction. Biologists continue to monitor the remaining birds in the Florida non-migratory flock to study the problems but this project is now inactive. Whooping cranes are an endangered species and are considered to be the symbol of conservation in North America. Whooper interests are working persistently and hoping for more successes in the conservation of these magnificent birds.